Now that summer is over, it’s time to store away our sundresses and wedges. We can finally start to embrace the latest fall fashions and incorporate major trends from the A/W 2018 runway collections into our daily wardrobes. There are still a few weeks left before temperatures really start to drop, but now is the time to start planning for the transition. Here are three major themes that dominated the runway—and pieces you can score without breaking the bank. Leopard print seems to appear season after season. It first came into focus in the 1930s, when jet-setting style-makers embraced its exotic appeal. Almost a century later, this staple shows no sign of disappearing. The playful print could be seen all over the A/W 2018 runway collections, from the ‘80s fueled Tom Ford collection to the voluminous statement pieces at Parisian label Gareth Pugh. When I first knew I was moving to NYC two years ago to attend fashion school, I made myself a rule: everything I would buy from then on would be black. It’s flattering on everyone, goes with everything, and leaves ample opportunity to accessorize with whatever you want. While black is undoubtedly stylish, should we really allow ourselves to fall victim to constantly dressing as if we’re going to a funeral? Just because colder temperatures are approaching doesn’t mean your fall wardrobe has to be dominated by dark and somber tones. The A/W runways were bursting with color—Barbie pink, lemon yellow, lime green, tangerine and hot magenta, just to name a few. If you’re feeling bold, don’t be afraid to inject a bit of color into your closet with a bright coat, bag or a pair of booties. The key to nailing this look? Stick to one shade: a monochromatic look head-to-toe is sure to turn heads. Or allow one piece to make a statement: let fluorescent boots or a neon bag do all the talking. 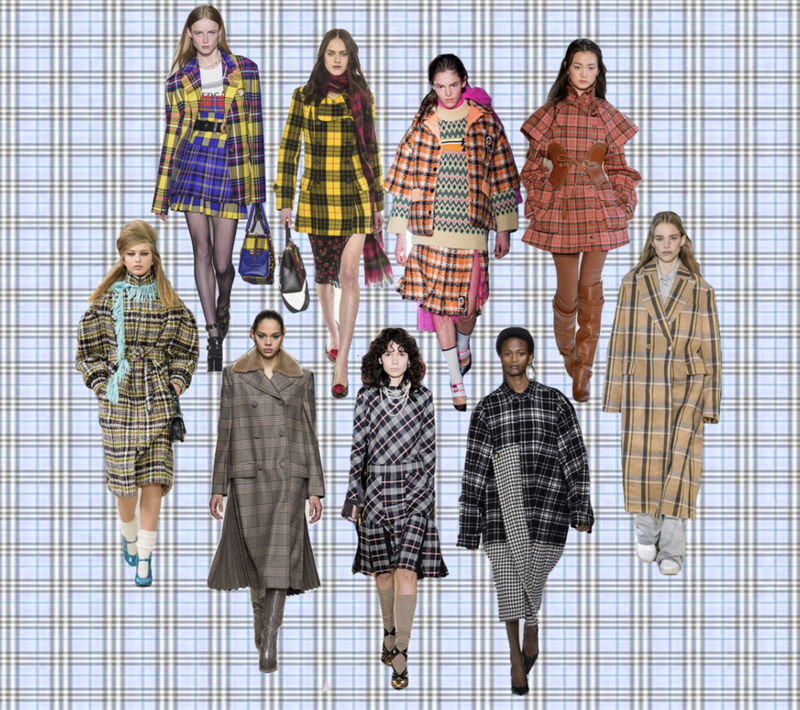 Plaid isn’t exactly a groundbreaking print, but designers got creative for the A/W season and found fresh ways to incorporate the classic pattern into their collections. Donatella’s collection for Versace was the ultimate tribute to her late brother, Gianni, revisiting his groundbreaking collections through pure ‘80s mania. Elsewhere, the trend appeared in both neutrals and brights everywhere from Miu Miu to Fendi. Check and tartan prints are a perfect way to elevate your wardrobe and transition your outfits from casual school days to more sophisticated work-ready looks. A high-waisted trouser, collared coat, or plaid mini skirt a-la Clueless are perfect ways to embrace this timeless trend.